As we drew closer to Swaledale about 8.30am, the weather was not looking too good. A grey sky was drizzling miserably and low cloud obscuring the high ground filled me with trepidation in case visibility was poor. I knew I was going to have to rely on other runners and markers to get me round the course. 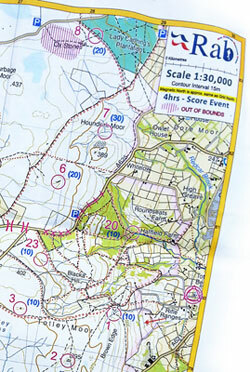 The route was described as being partially marked and marshalled at key direction changes, but it looked fairly straight forward on the map. 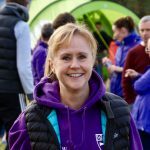 As usual, my insecurities about navigation came to the fore but as a map wasn’t compulsory I felt reassured that it would be OK. We met Elaine Bisson in the car park who had planned to run with John Ayres. Unfortunately at 06.30 that morning John had called to say that he had injured his back and that he couldn’t run. Like me, Elaine had no map and hadn’t had a chance to look at the route as John had planned to show her round. It was hot and I was pleased that there were 5 drinks stations, having previously thought it was a bit of overkill for 33k. I made a point of drinking at each one but still ended up a bit dehydrated at the end of the day. At roughly the half way point I reached the famous Tan Hill pub where Mel and Dave caught and left me, and I where my husband, Scott, was waiting with camera in one hand and a half pint of ‘Ewe’s Juice’ ale in the other. I could see he was twitching that I stopped at the checkpoint to eat one of my mini cheese and pickle sandwiches (washing it down with water and an excellent flavourless isotonic drink). Although I was pretty quick I expected to have an ear bashing at the finish, which was duly delivered. 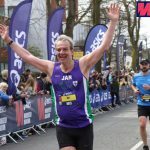 Yes, I accept that my drinking and eating on longer races could be more efficient but I’ve not got the knack yet so give me a chance, I only started racing 9 months ago! The route then continued on a grassy/tussocky/boggy descent and very rocky trails. At one point my injured leg disappeared into a black, squidgy, peat bog (though it probably did the grazes some good). Out, up and off again, I was on a roll. Feeling low on energy I had a very quick drink and a gel at the 23K station and was soon feeling pretty good again. It didn’t seem long before I passed the 28K checkpoint and came upon a narrow, rocky steep incline, albeit short with a marshall at the top who directed me to the left saying ‘Only another couple of K to go’. That was a looooooong 2K! There were groups of walkers coming in the opposite direction; the path was intermittently narrow and rocky, up and down, but most of the walkers moved to let me past. I thanked them, one and all (had a Striders vest on and had to at least APPEAR to be nice) and was looking forward to a leisurely flat and grassy finish. Eventually I went through a gate – which closed with a loud clang – and at last could see, in the distance, the finish alongside the river. A few brief seconds later I heard the gate clang again. I knew it was another lady, who had shadowed me for much of the race and I thought that if she overtook me now I was incapable of increasing my pace for that distance so I would just have to accept that she is a better woman than me. But it didn’t happen and with about 50 metres to go I eventually heard her breathing heavily behind me – right on my shoulder. All I could think was (penny in the swear box) “there’s no ******* way she’s taking my place now!”. I mustered up some energy from somewhere deep down, somewhere that I had never before delved into, and ran hell for leather! It paid off and I beat her by 2 seconds. Although I thought I had 3 or 4 runners behind me, I was chuffed to find that there were actually 10. My jubilation that I’d not let myself nor the Striders down was embellished by finding out that Elaine had finished 3rd lady overall. Now I’m back home nursing my bruises and looking forward to the next challenge…. Anybody know if arnica’s any good? Hell Freezes Over at the Hobble! 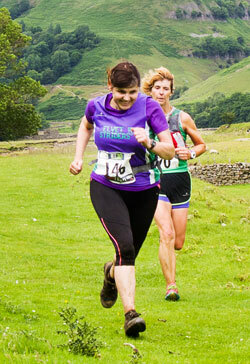 This was my very first fell race: I entered on the day with relative confidence that I could finish it without getting lost but had no idea about how long I would take. It was 0°C when we bundled out of the car into the school sports hall where I was worrying about the kit check. I had all of the essential kit with me, but if I’d been asked any more than could be written on a postage stamp about how to use the compass, I would have failed miserably although my appreciation of the route was helped by having taken the time to study the course map and Google Earth at home. After a brief pre-race talk we filed out to the start and were off pretty quickly, straight up a viciously steep hill then, after a fairly short section of road, we reached the first check point and turned left onto the fell for the first time. I started off trying to avoid the inevitable foot soaking, but once my feet were wet, there was little to lose, which made navigating through the mud and puddles much easier as I could stop dancing around as much to avoid the water. It wasn’t long before a vicious snow storm descended upon us, carried on a biting arctic wind. The snow, alternating with hail, was being driven with force horizontally onto the side of my head and face and I was forced to stop and dig around in my brand-new bumbag for some warmer gear. I could see why we had to carry it all. If anyone had to stop with an injury in this, they would become dangerously cold very quickly. Many were putting on jackets but all I wanted was my hat, which provided as much protection as I felt I needed. Off I went again and was constantly trying to find decent footing. There were huge icy-cold puddles – some almost knee deep – and slippery mud (though not as slippery as Aykley Heads cross-country mud I thought), with the track deeply rutted with loose stones in places making it frequently easier to run on the heather. Soon I was descending to the first burn where I was protected from the wind, with the snow no longer falling as little ice swords, but as fluffy, fairy-tale, flakes. Then it was steeply up the other side to continue on the exposed track. Although the route was pretty obvious and there were always others to follow, there was at least one place where I could easily have taken a wrong turn but I had my trusty map with me and knew exactly where I was…no compass required! Not much further along the track we were marshalled back onto the fell where deep ruts seemed to be too narrow to run along the bases and also too narrow to run along the tops so it was a constant battle to keep going. Eventually though, I saw the small plantation that signalled the start of the next road section after which it was a long run along the road to the steep track that led to the final section of exposed fell. I knew I was more than half way but could not relax into the run because once again, the vicious horizontal snow started, this time full into my face as I was now heading back towards the start. The combined snow and wind was so bad that my face was freezing and incredibly painful. I tried to protect it with my map at the expense of my hands but managed to keep running. I found this section more challenging than the first and was constantly trying to choose the best line, which was difficult with reduced visibility due to the snow. 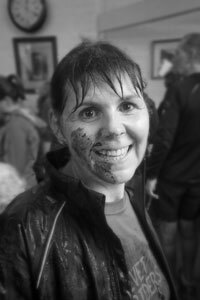 My legs were starting to feel quite fatigued and I could feel another spectacular face plant coming on (to go with the one I did on the Hardmoors half at Goathland)! But before anything drastic happened, I’d reached the marshalls on the edge of the fell who were reassuring us that it was “nearly done…all downhill now”. The road ahead seemed to go on for a very long way and I was perturbed not to see any signs of a village. I was overtaken by some runners who seemed to be enjoying the dreaded tarmac that is my personal nemesis. Then Scott, my husband, appeared as a welcome friendly face to cheer me on and tell me that I didn’t have much further to go. I took great delight in running down the field to the finish line to see Penny and Flip, on their way to the car, cheering me in. Back in a nice warm sports hall, I was taking off my shoes as requested and whilst my sausage-like fingers were struggling with my laces I was trying desperately to tell a woman who was offering to help runners with their shoes that there was a pin on the floor as lots of runners were in stockinged feet; my frozen face and lips would not respond however, and I couldn’t say the words without gibbering! I was never so pleased for a warm cup of tea. There were a few pretty sickly looking runners in the hall, shivering in space blankets so I felt quite lucky that I was not hypothermic in such extreme conditions (despite having not used my jacket or gloves) and it was only my face that had felt the cold. Even my hands were warm when I first got back. I did manage a chuckle when I overheard one runner in the hall say that he couldn’t understand why he had to have a compass as he would ever need to draw a circle on the fell! I was well impressed with the marshalls who were standing around in very exposed places in the same blizzard conditions that it was cold enough running in. They were all friendly, encouraging, and positive. I am really grateful to them for being there for us, and for everyone who baked scones and cakes and fed us hot drinks. I won a nice buff as a spot prize (donated by the race sponsor – the Ultra Runner Store) and it was good to meet the chap who provided them. 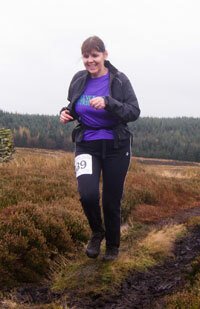 I shall never forget the first of what I hope will be many fell races. It was an experience and a half, and I am assured by my husband that I will probably have to do a lot of fell runs to encounter such conditions again. 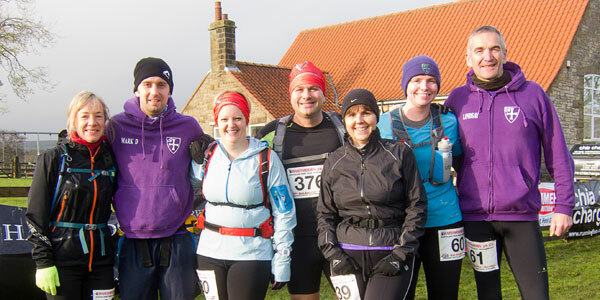 I entered this off-road half marathon, which was part of the Hardmoors 26.2 Trail Marathon series of races, with trepidation having never run a trail or fell race before. I had gone over the course on the map with a little help from my husband Scott, and felt sure I stood little chance of getting lost, but it was nice to have the reassurance of a backstop runner just in case. After meeting up with Phil, Juliet and Anita, who were also doing the half marathon and Anita’s husband Mark together with Lyndsay and Helen Rodgers who were all doing the 10K (Dave Robson and Mel Hudson were doing the marathon but I never actually saw them), we set off on what was a chilly (six degrees) morning with a promise of rain by the afternoon. Following a gentle downhill start, the steep steps of the first incline got the blood pumping ready for the action at the top. Through the woods, we passed the spectacular waterfall of Mallyan Spout then crossed the river via stepping stones that were about 6 inches below fast flowing water (I had thought at the race brief that the stepping stones had been a joke and so it seemed did the runner behind me). Then, after a tough climb out of the woods, we were onto the fell sections which were pretty muddy (up to the knee at times) but the views were great. 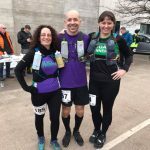 The two jelly babies I took from the 1st checkpoint were carefully tucked away in my pocket but they were a sorry state when I eventually took them out at home! The later sections of forest track however were not my thing at all: they were fast (I’m not) and long and not at all enjoyable as several runners caught and passed me. Scott came with me for support on the day and was running around with the dog taking photos. He cheekily told me later that he was disappointed about his failure to get a photo of me belly down in the mud after I made a full-length ‘face plant’ courtesy of the effect of muddy, rocky paths on tired legs. However, the resulting face decorations seemed to delight many back at the village hall! 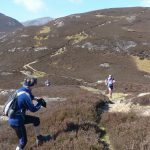 I was really pleased at how I went overall – particularly over the last fell section – not fast but nice and steady, catching other runners every now and then. Unfortunately, as soon as I hit the road on the run into the finish in Goathland, quite a few passed me, some of whom had overtaken me on the previous road section and who I’d then caught on the fell. I was chuffed to get back in time for the presentations having previously laughed at how early they were (I expected to be out much longer than I was) and for the fact that I was never close enough to the back to be able to see the backstop runner (hallelujah!). We had escaped all but the slightest sprinkle of rain, but the marathon runners including Dave and Mel were not so lucky. 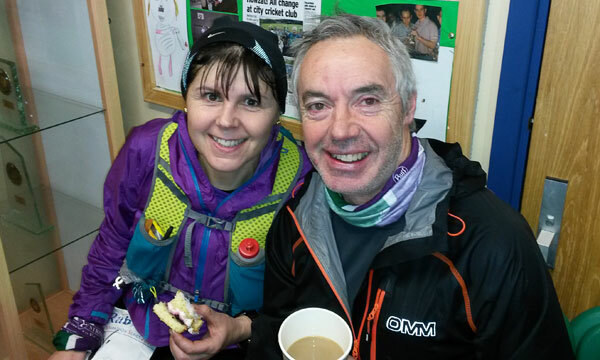 By the time we were chomping on well-deserved quiche and cakes (very nice!) the rain was falling heavily and it was still only one degree higher than the morning. I can see now why waterproofs were compulsory but was quietly pleased that my race had ended.